This year Sifu Wei Ling Yi visited Sweden for 7 days from 9 – 15 October. In total he held seminars in 5 places - Stockholm, Eskilstuna, Ulricehamn, Höör and Ravlunda - and one weekend course teaching the method Sitting on your lotus in Höör. In the afternoon on 9thOctober, Sifu arrived to Sweden’s capital Stockholm to hold a lecture! Focus of the lecture was to show the participants the importance of holding the power of health in one’s own hand. Sifu explained that it is good to come to the seminars to receive the energy that he is transmitting, to get an energy boost, healing energy. He explained very thoroughly that the extra energy that one gets from attending the seminar can be very healing for the body and the soul, but, the effect will not last. He emphasized during the lecture in Stockholm, but also during all the lectures in all the cities he visited in Sweden, that the only way to make the energy last is to start to practice diligently oneself. There was an urgency in the lectures that has never been so prominent before, and many of the participants also felt it. The importance to start taking care of oneself right away and not to procrastinate. During this one week of lectures with Sifu Wei Ling Yi, there was a feeling that more participants really understood of what Sifu was teaching, they became aware of sthe core of the YiXue teachings. To learn how to heal yourself and to pass the methods on to others in order to create a chain reaction of helping each other and helping the earth. Sifu was for the second time in city of Höör and held a weekend meditation retreat teaching the meditation method “Sitting on your lotus”. 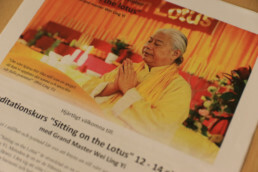 A method to teach the participants to go into silence, to meditate with the aim to find one’s own Lotus. The course was held at a beautiful place in the middle of a forest – Backagården. Many of the participants enjoyed the opportunity to be together, train together and go into the stillness together. There was a unique feeling of healing this weekend and the feeling of joy. The whole seminar tour ended in the countryside in the village of Ravlunda on the east coast. Many people came to listen to Sifu. There were so many people coming, thus all the chairs in the house had to be used. Normally around 20-30 people come to the seminars in Ravlunda, but this year there were over 50 participants! The training leader in Ravlunda, Lena Viredius, thinks that this has to do with the increasing number of people coming to join the weekly training group. The group is getting stronger and the Qi in the training group is rising. So many positive things have happend in our growing training group in Ravlunda, Österlen. It is fun to see how the interest in the YiXue training has increased, also among younger people. Many who come and join the training group already feel the energy from the first time and express how easily they get into the training and into the group. It’s a great pleasure to lead the training in the group. I get a lot of energy from leading the training but at the same time I am able to go into deep concentration and get in contact with the group’s strong collective energy. In Ravlunda, a journalist came to interview Sifu Wei Ling Yi to ask him about his work. The article will be published in one of the biggest spiritual newspapers in Sweden in the beginning on January 2019. This is the first time that the YiXue culture will be mentioned in a spiritual newspaper in Sweden.